NYT Archives and Old Music! Interested in what the New York Times was publishing from 1851-1922? Well, now you can see for yourself. The TimesMachine allows you to view, print and download as PDF all the articles printed by the NYT during those years. Another old-timey offering online, the Library of Congress just released a service they’re calling the National Jukebox. This service makes available historical sound recordings for FREE! Currently the National Jukebox has over 10,000 sound recordings from the Victor Talking Machine Company (through a license agreement with Sony) from 1901-1925. So enjoy your summer, and spend a few minutes checking out these great historical resources! Want to see what Zotero can do for you? Watch the quick video below that Zotero made explaining its services. If you have additional questions about using Zotero, please feel free to contact a USF Librarian and they can help get you started. Previously, only media studies classes were allowed by the Digital Millennium Copyright Act (DMCA) to show film clips in their classrooms. Thanks to a recent update on exemptions to the DMCA by the Librarian of Congress, now all faculty and university instructors are able to show film clips in their classrooms without violating copyright laws relating to public viewing. The new ruling states that all faculty and university instructors can willfully and lawfully circumvent the Content Scrambling System on DVD’s for teaching purposes. This does not, however, grant faculty privileges to put clips of videos or films they do not have rights to online or to make use to illegally obtained videos in the classroom. If you have questions on the legality of your use of video in the classroom, please speak with a librarian and we will do our best to guide you in terms of your allowances as an educator. To update your feed, either copy and paste the above link into your reader where you are able to add a subscription or simply click the orange RSS subscription box at the right of the screen. If you have additional questions, please see Lisa Quinn. While once the dominant web browser Internet Explorer 6 is becoming largely unsupported by many websites, making upgrading to a newer version of IE, or another free browser such as Mozilla Firefox or Google Chrome, important. YouTube is one of the biggest upcoming websites to drop IE6 with the browser becoming unsupported on March 13th. 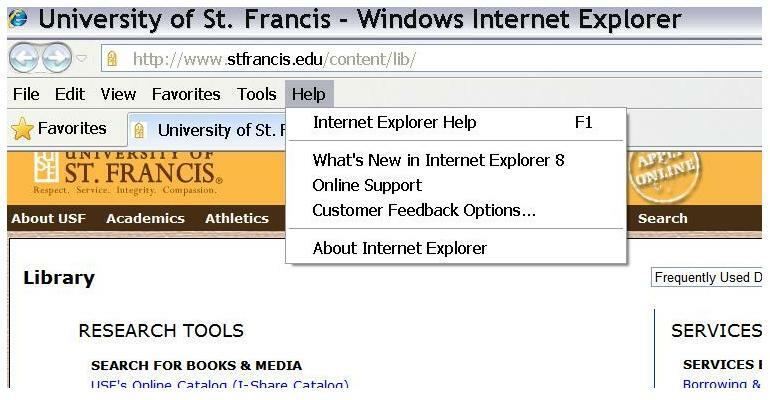 If you use IE and are unsure what version you are running, open Internet Explorer and click the Help option at the top of the screen, then choose, About Internet Explorer. Here it will tell you what version you are running. While he claims to get his information from books and not Wikipedia, French philosopher Bernard-Henri Lévy, is in some trouble for citing a fake philosopher, Jean-Baptiste Botul, in his most recent book. Botul, unfortunately, is nothing more than a creation of journalist Frédéric Pagès, though a creation complete with his own Wikipedia page (in French), a Facebook profile, a name for his philosophical ideas (Botulism), and a fan club that meets monthly. At USF Library, we’d just like to use this story to highlight the “Dependability” and “Credibility” aspects of evaluating your resources when doing research on any topic. Be sure to not cite Wikipedia as a resource, and if you can’t find the information you got on Wikipedia or any other free Google-able website anywhere else, don’t use it. Have questions on what makes a resources a good one? Check out the library tutorials on evaluating resources and websites. Looking for a way to access your files from anywhere? Now Google Docs is accepting any kind of file, not just the .doc, .pdf, images, .xls and .ppt files like before. Now you can upload any file type, up to 250 MB in size and store it in Google Docs. So for all of us who have left our flash drive with a term paper on it in a computer somewhere, this offers a much easier option. And with Docs’ sharing capabilities, you can share that zipped folder with lots of people easier than trying to email them all the attachments. The 1 GB limit is more than enough for most people, but if you must have more, Google is offering additional space at the cost of 25 cents per GB. If you don’t already have a Google or Google Docs account, get one here.